Saturday, April 20, 2019 3:00pm-til? 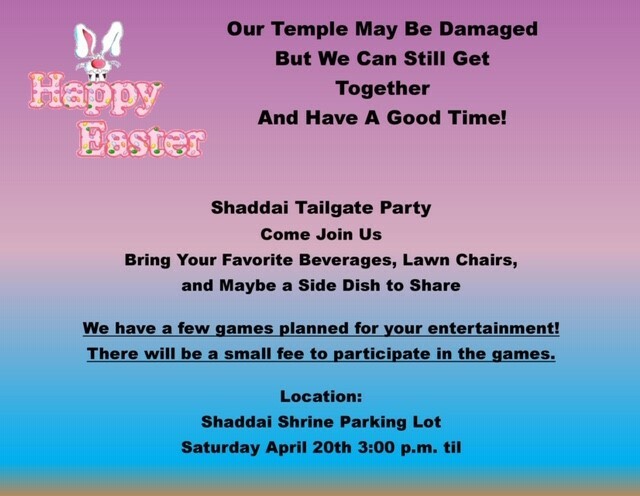 There will be a adult game night injection with the tailgate party this month. The games will be played in team of 4 people at a cost of $40.00 per team. There will be adult drink served at each of the games for those like to drink. there will be awards for the 1st, 2nd, and 3rd place team. To restore your team please contact Tamara Bowdish @ Tamtam04040919@yahoo.com. There will also be a $10.00 drink and drown. Please pass the word and come out and support your temple. If there are any questions please contact Chris or Tamara Bowdish.